Hey Everyone and Welcome to Techno Geek Zone, today I will help you in introducing out the best and working Google Adsense alternative of earning online via your blog using Infolinks. Are you new in this Blogosphere? No reason to worry about that because once I was also. So let's talk about for what you are here - Yes! Infolinks. Infolinks is one of the best Google Adsense Alternatives so far. Unlike Google Adsense, it does not display traditional display ads which Adsense serve. Rather, the intent of Infolinks ads is to combat the end user's banner blindness by introducing less prevalent ad units that are better integrated into the website’s content. Infolinks’ inFrame, inSearch, inTag, and inText units are designed to do just that. Below is some general information regarding the network. 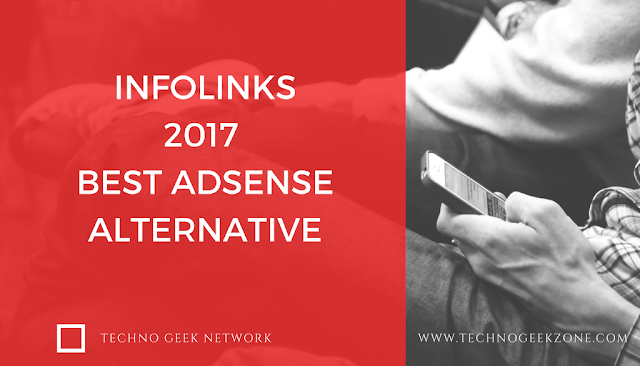 If your Google Adsense account is banned then you may give Infolinks a try. Although this network is not so much popular than Adsense, as far as I have used them I can only say that their ads are good and non-intrusive type somewhat having good banner and media, embedded ads also work fine for most of the cases. Infolinks is also meant for medium quality bloggers and doesn't need many high visitors to work and pay you. Feel free to join this Globally recommended ad network and comment your views in the comment section. Does studads advertising network also the best alternative to Google Adsense?